"2018 Taipei Style Day" , Zhou Shan-xu, Lu Jia-yi and Lu Ying-Ying introduced the characteristics of Taipei City with more beautiful elements in the future. 瀅）, Vice President of Taipei Flowers Auction Co. Ltd., the three leaders have long cultivated fashion brands, shared the same concept of creating a life aesthetic brand, and are all committed to the core values of their own products. In addition, they spare no effort to promote cross-domain integration and create an aesthetic style of Taipei city. Through the event of "2018 Taipei Style Day" , they will introduce the characteristics of Taipei City with even more beautiful elements in the future. The event’s participants included Taipei Flowers Auction Co. Ltd. and the other six companies; Arts and Fashion Association Taiwan; Mandarin Florist; Milu Design’s designer Kenny and a lot of young performance groups. They work together to brand Taipei, and utilize the "2018 Taipei Style Day" as a platform to attract more industrial cooperation and development, build a rich and beautiful city, connect the existing local sceneries and enhance the perspective of the global city. Zhou Shan-xu, Chairwoman of the Arts and Fashion Association Taiwan, said that it is another possibility to present the city’s brand. As the fashion creativity of Taipei City is booming, the release of artistic energy and the rapid development of the internet will quickly and directly link Taipei City to the image of a city filled with creativity and taste. 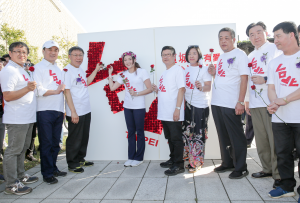 Lu Ying-ying, Vice President of the Taiwan Flowers Auction Co., Ltd. also said that since the "A Bunch of Flowers" event was introduced last year, it has helped promote the concept of beauty. This year’s event further allows Taipei citizens and the six major companies to work together to promote the concept of "urban aesthetics" and guide the city’s development in the future. She hopes that the reality and aesthetic life will be implemented in Taipei at the same time. 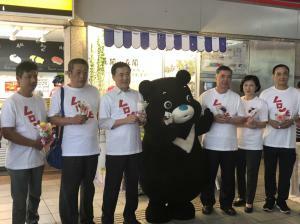 Several designers who are enthusiastic about participating in the creation of city brand have used the pace and ideas of Taipei citizens’ daily life in this event to present the characteristics of Taipei City in an afternoon party, which greatly enhances the feelings of the city’s cuisine , beauty and living . Having taste in life is about being persistent. Whether it is like Paris's insistence on aesthetics or it is constantly proposing more new ideas, the goals is to create a "Taipei style" defined by the city, to walk its own path but in steps with the world in terms of taste.